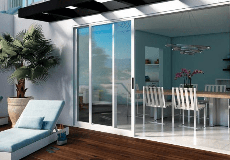 A well chosen window and door offers benefits of healthier living and comfort in addition to the aesthetics. Beyond energy efficiency, beyond beauty, windows and doors are carefully placed to maximize enjoyment of healthier living. Air quality is typically thought of as an outdoor issue. But indoor air can have two to five times the level of pollutants as the outside air*. Inhibitors such as mold spores, dust, cleaning chemicals, pet dander and off-gassing from carpet or furniture contribute to the high amount of pollutants. Americans spend as much as 90% of their time indoors and having access to natural ventilation can greatly improve the quality of air breathed. When properly placed, operable windows provide access to clean, fresh air for occupants as needed. This natural ventilation flushes out stale air, which is particularly important in tightly sealed buildings. Is there a side of your house that gets icy blasts of wind? Consider non-operating windows such as picture windows and radius windows on that side. These are among the best options for keeping the elements out of your home while letting natural light in. Keep in mind that smaller windows will be more efficient in these situations. In a bathroom, you probably will want at least one operable window to vent moisture so you don't have to rely solely on a fan. If your home gets a lot of sun exposure, you'll want to use extra high-efficiency forms of Low-E insulated glass to reject more of the sun's heat and damaging rays while still enjoying window light. Windows facing east and west get low-angle sunlight in mornings and afternoons, and windows facing south can get low-angle sun in spring, fall and winter, particularly the farther north you live. All of these conditions can be blinding and especially troublesome in a room used for watching television or working on a computer. High-efficiency Low-E glass, shades, curtains, low overhangs and awnings can be used in various combinations to help alleviate these effects.